Sebastiano Florigerio (also Florigorio), Italian painter pupil and probably son-in-law of Pellegrino da San Daniele. 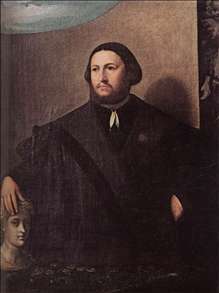 He was active in Udine (from 1524), Padua, and Cividale, and elsewhere. He was one of the gifted Friulian masters, yet some of his figures look as though they have been cut out of other paintings and inserted into a new scene. Some of his work is reminiscent of Dossi. See more details about "Portrait of Raffaele Grassi"